If you try to touch this Dark Elf, he will cut you. Elves come in many flavors in the Elder Scrolls, perhaps most prominently - or at least most eye-catching-ly - the Dark Elves, or Dunmer. Originally hailing from Morrowind - the mushroom and bug filled province that provided the setting for the third Elder Scrolls game - the Dark Elves have spread to every corner of Tamriel, including the northern lands of Skyrim. 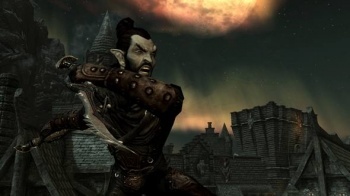 This first look at Skyrim's Dark Elves is the result of a pair of polls that Bethesda conducted on the game's official Facebook page: The first to determine the character's race from the ten the game has to choose from, and the second to determine the character's play style - thief, mage, or warrior. Thief won out over mage or warrior, and the Skyrim team set to work putting together a rather angry looking Dark Elf, wielding a pair of rather nasty looking daggers. The image is rather dramatic - although that's not a bad thing - but I think that Bethesda has missed a trick by not showing the Dark Elves' red eyes. An angry guy who wants to cut you is one thing, an angry guy who wants to cut you and whose eyes burn like a raging fire, is an even scarier proposition.